In 2017, close to 380,000 visitors took part in activities organised by Het Nieuwe Instituut in Rotterdam, in other locations in the Netherlands, and abroad. Although, compared with the year before, there was a decline in the number of visitors abroad – primarily because in uneven years there is no Architecture Biennale in Venice – the number of visitors to exhibitions, lectures and events held in Rotterdam continued to grow. With more than 191,000 visitors, Het Nieuwe Instituut is now one of Rotterdam’s leading cultural players. The institute has also firmly established itself as a place for the youngest generations to learn about the essentials of design and innovation through its educational programmes. The programmes for primary and secondary education were extended in 2017, reaching a total of 17,000 schoolchildren. There were also more than 600,000 virtual visits, to the website and the search portal. Internet visitors included professionals, academics and interested members of the public, with a striking increase in interest seen among younger age groups. Through general and specialized activities, and supported by focussed communications, the institute has built a large following among young architects, designers, students and the general public. 2017 marked the beginning of a new policy period (to continue until 2020). Het Nieuwe Instituut now presents itself in the form of three clearly defined elements: the Museum for Architecture, Design and Digital Culture; the State Archive for Dutch Architecture and Urban Planning; and the Agency for Architecture, Design and Digital Culture. The Research and Development department functions as the link between these elements, each of which represents a different aspect of the institute’s broader remit. In the first policy period, Het Nieuwe Instituut experimented with themes and approaches to establish itself as a unique place where all the design disciplines can be viewed from an integral perspective. In this respect, it proved itself to be a generator of ‘disruptive innovation’. In 2017, the focus shifted to the development of new formats and products, and to anchoring the institute in its surroundings, not least of all in terms of the way in which the accommodation – the galleries and study rooms, offices and public spaces – are shared with the outside world. This has strengthened the community of users around the institute. Significantly, the institute has chosen to position itself not as a classical museum focussed on presentation but rather as a hybrid – somewhere between a museum and an academic institution – where research, symposiums, presentations (and even a curriculum around our ecological garden) function as catalysts for the creation of new knowledge. The activities of the Museum for Architecture, Design and Digital Culture focus on the designed world and how this is constantly being (re)shaped by new technologies, fresh ways of thinking, and shifting social priorities. The programming of the exhibition spaces in Het Nieuwe Instituut was divided into two periods in 2017. The first six months featured exhibitions that took their starting point from various design disciplines and which reflected upon the changed meaning of ‘authorship’ in design. Architecture of Appropriation, for example, with a spatial installation by Rotterdam-based studio ZUS, showed how various forms of appropriation, such as squatting, make an ‘authorless’ yet essential contribution to the development of the city and the public realm. The exhibition also represented the start of an ongoing research programme into the architecture of appropriation that will find a reverberation in the State Archive. Within the domain of digital culture, research into the almost redundant phenomenon of the screensaver – the first fully computer-generated image – resulted in the exhibition Sleep Mode: The Art of the Screensaver, curated by internet artist Rafaël Rozendaal. In the large gallery on the ground floor, Het Nieuwe Instituut continued its series of materials exhibitions with Designing the Surface, an exploration of product finishes, based on research by HNI fellow Chris Kabel. With their speculative project The Transylvania Archive, art duo Marta Volkova and Slava Shevelenko established a bridge to the central themes of the autumn programme. The programming in the second half of the year was devoted to the wealth of possible interpretations of archives and collections. The breadth of this theme was wonderfully demonstrated by the exhibition Finders Keepers – a collection of collections – curated by the editors of the design and crafts magazine MacGuffin. Finders Keepers elucidated collectors’ wide-ranging motives and strategies: the aesthetic of the hidden life of things. In parallel, Het Nieuwe Instituut showed several recent projects in which the State Archive was the subject of interpretation by artists and designers. These Archive Interpretations featured projects by Lernert & Sander, Studio Rotor, and Studio Makkink & Bey. The archive of the French army was central to the project Discrete Violence: Architecture and the French War in Algeria, an exhibition based on research by Samia Henni (ETH Zürich) about the architectural response to the revolution in Algeria between 1954 and 1962. The institute took over the exhibition The Other Architect from the Canadian Centre for Architecture (CCA), an important partner of Het Nieuwe Instituut. Using archival materials, the CCA showed how architects since the 1960s have introduced new, largely multidisciplinary, working practices in order to seek answers to social and cultural issues. From the beginning of 2017, the weekly Thursday Night Live! public programme was linked to free evening events in the museum. In addition, pop-in exhibitions were organised every two weeks. In 2017, a total of 47 evenings were held, featuring 127 appearances by 331 speakers and performers. The many partners who have supported these activities include OMA/AMO, BNO, BNA, the Mondriaan Fund, the office of the Chief Government Architect, Argus, Wageningen University, TU Delft, and ETH Zürich. Public participation in the programme doubled, from an average of 80 visitors per evening in 2016, to more than 160 in 2017. Themes discussed included the lack of a state spatial policy in the series Ministry of Spatial Affairs (with Yttje Feddes and Sybilla Dekker, among others), Decolonising Design, Squatting the Archive (about the spatial significance of Dutch squatting history), Reading Room, Design Dialogues, a critical look at algorithmic process in the Bot Club, De Stijl as an interiors project, and the representation of architecture (in partnership with The Berlage and e-flux Architecture). The programme aims to connect with existing and new audiences and therefore has a highly accessible character. Its core functions are knowledge sharing, networking, talent development, and partnerships. The growing public interest suggests that the programme meets a very real need within the field. The archives and collections themes were also celebrated beyond the institute, especially in partnerships with other museums on the occasion of the centenary of the founding of De Stijl. The institute co-produced the successful exhibition Architecture and Interiors: The Desire for Style with the Gemeentemuseum in The Hague, and for the Cannes Film Festival the institute commissioned Studio Sabine Marcelis to create an installation inspired by De Stijl that served as a meeting place for the international film industry. A variant of the installation was later shown at Het Nieuwe Instituut. De afdeling Research and Development heeft een centrale rol in de wijze waarop Het Nieuwe Instituut de ingrijpende veranderingen in cultuur, samenleving en technologie ondervraagt. Praktische problematieken vormen veelal het uitgangspunt. Het onderzoek draagt bij aan het publieke programma van het instituut – tentoonstellingen, lezingen, symposia etc. – en aan de verdere ontplooiing van langlopende thematieken zoals Architecture of Appropriation en het leidende thema voor 2018, Automated Landscapes, dat zich niet alleen in Het Nieuwe Instituut zal manifesteren maar ook in het Nederlands paviljoen tijdens de Architectuurbiënnale van Venetië. Een bijzondere rol is weggelegd voor het Fellowship programma (met drie nieuwe fellowships in 2017) en het Jaap Bakema Study Centre, in 2013 opgericht door Het Nieuwe Instituut en de TU Delft. De onderzoeken die hier worden geïnitieerd kunnen ook impact hebben op samenstelling en ontsluiting van het Rijksarchief, en op de samenwerking met externe partijen, zoals die met het Ministerie van Defensie rond internationale vredesmisses. The Research and Development department has a central role in Het Nieuwe Instituut’s exploration of radical changes in society, technology and culture. Practical issues are frequent starting points. The research contributes to the institute’s public programme of exhibitions, lectures, and symposiums, and to the further development of long-term projects such as Architecture of Appropriationand the main theme for 2018, Automated Landscapes, which will be presented not only in Het Nieuwe Instituut in Rotterdam, but also in the Dutch pavilion at the Venice Architecture Biennale. The department also plays a crucial role in the fellowship programme (with three new fellowships in 2017) and in the Jaap Bakema Study Centre, established in 2013 by Het Nieuwe Instituut and Delft University of Technology. The research initiated here can inform the work of the State Archive and partnerships with external parties, such as that with the Ministry of Defence around international peace missions. In 2017, the Jaap Bakema Study Centre (JBSC) organised a series of activities, including the annual Bakema conference. The 2017 conference theme was ‘Tools of the Architect’, and the keynote speech was given by Professor Michiel Riedijk (TU Delft). Around 250 architecture historians from the Netherlands and abroad attended the conference. The JBSC also worked on several long-term research projects, a congress and research studio with Brussels-based practice Rotor, and publications such as Total Space, in partnership with GTA/ETH Zürich, and Special Collections Harvard GSD. In 2017, Dr Dirk van den Heuvel, head of the JBSC, received a Richard Rogers Fellowship from Harvard University. The key term for the State Archive in 2017 was ‘digitisation’. The digitisation of the entire collection is on ongoing process. It is increasingly important to develop knowledge about born-digital archives: archives that were created entirely within computer files. Digitisation greatly enhances access to the collections and enables new ways of using them. It creates new opportunities, but also raises questions about what should be preserved for future generations. Which current practices will be transformed by archiving in our future history? Important acquisitions were linked to Malkit Shoshan’s fellowship and the Dutch contribution to the Venice Architecture Biennale in 2016, and the role that the squatters’ movement played in urban development. The expansion of the collection is based on the qualitative assessment of archives of individual architects/urban planners and practices. In 2017, the State Archive acquired parts of the archive of the architecture practice Ellerman, Lucas & Niemeijer, and via Crimson Architectural Historians it acquired the archive of the WiMBY! Project. Furthermore, archival materials relating to architects J.J.P. Oud, K.P.C. de Bazel, I. Moerman, W.M. Dudok, Vucht and Steigenga were acquired. In 2017, Het Nieuwe Instituut provided 294 loans to other institutions, including the Rijksmuseum in Amsterdam, the Gemeentemuseum in The Hague, Museum Rotterdam, Museum Boijmans Van Beuningen, Musées de la Ville de Strasbourg, Muzeum Sztuki w Łodzi and the Deutsches Architekturmuseum in Frankfurt am Main. 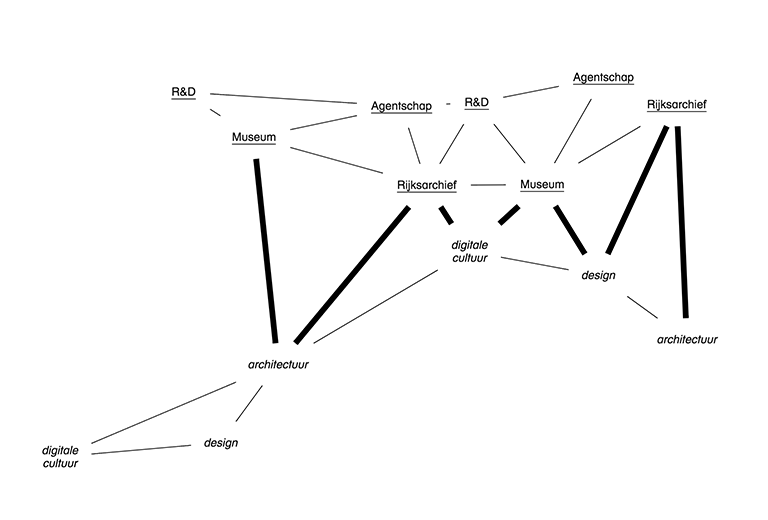 Since 2016, Het Nieuwe Instituut has bundled its activities at local, regional and international level in the Agency for Architecture, Design and Digital Culture. Since 2017, the Municipality of Rotterdam no longer provides the institute with structural funding but with support on a project basis. In 2017, this resulted in Letters to the Mayor, a partnership between the Municipality, Storefront for Art and Architecture in New York, and Het Nieuwe Instituut, in which local architects were asked to write to the mayor with their ideas for improving the city. DATAstudio, the long-term partnership with the Municipality of Eindhoven around the concept of the ‘smart society’, was concluded in 2017 with the exhibition Embassy of Data. The project aimed at creating awareness of the possibilities and potential dangers of data use. The exhibition welcomed 63,000 visitors and was a successful conclusion to a spectrum of activities including lectures, courses, publications, an international conference, and the MapLab educational programme. The Agency for Architecture, Design and Digital Culture fulfils a co-ordinating function aimed at facilitating international activities. It conducts an annual ‘talent mapping’ exercise in order to gain an overview of talented graduates in the various design disciplines. It also develops international crossovers in which Dutch design expertise is harnessed to address important social issues, such as the City Forces programme developed in partnership with Storefront for Art and Architecture in New York. In 2017, it also issued the open call for proposals for the Dutch pavilion at the Venice Architecture Biennale in 2018. An important part of the agency’s task is the International Visitors’ Programme (in association with the Ministry of Foreign Affairs, among others), which facilitated 167 visits in 2017.